Our product range includes a wide range of annealing ovens. "Agnee " Hot Air Oven is designed on the latest technology and innovative mechanism. It is designed to work in an excellent manner for long time period. This Hot Air Oven can be availed in various specifications as per the requirements of the clients. 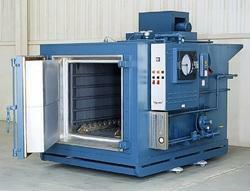 We can supply this oven in electric, infra red heating gas fired, oil fired.